One man’s perilous quest to cross Antarctica in the footsteps of Shackleton. Worsley felt an overpowering connection to those expeditions. He was related to one of Shackleton’s men, Frank Worsley, and spent a fortune collecting artefacts from their epic treks across the continent. He modelled his military command on Shackleton’s legendary skills and was determined to measure his own powers of endurance against them. He would succeed where Shackleton had failed, in the most brutal landscape in the world. In 2008, Worsley set out across Antarctica with two other descendants of Shackleton’s crew, battling the freezing, desolate landscape, life-threatening physical exhaustion and hidden crevasses. Yet when he returned home he felt compelled to go back. On November 2015, at age 55, Worsley bid farewell to his family and embarked on his most perilous quest: to walk across Antarctica alone. David Grann tells Worsley’s remarkable story with the intensity and power that have led him to be called ‘simply the best narrative nonfiction writer working today’. 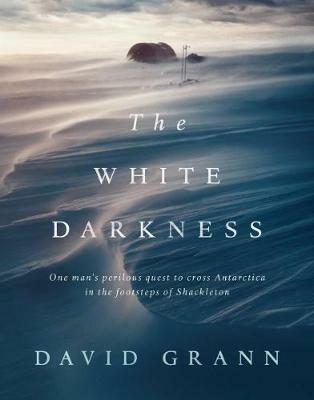 Illustrated with more than 50 stunning photographs from Worsley’s and Shackleton’s journeys, The White Darkness is both a gorgeous keepsake volume and a spellbinding story of courage, love and a man pushing himself to the extremes of human capacity.